Death of Mihana Kalaniwahine Ai, 1928. Mrs. Mihana Kalaniwahine Ai Passed on. At 10 o’clock P. M. of the evening of Wednesday, death visited the home of Mrs. E. A. Nawahi at Homelani, and took the life breathe of her youngest sister Mrs. Mihana K. Ai, at nearly 66 years of age. She was born here in Hilo, on the 24th of April in the year 1862 from the loins of Kahaoleaua and Ai-i, her father, one of the first Chinese who arrived in Hilo nei, and he arrived along with Hapai, Akau, Keoni Ina [John Ena], Akina, Keoniko, and Aiko, and these Chinese were the first ones to start Sugar Plantations at Amauulu, Paukaa, Kaupokuea [Kaupakuea], and Kohala. More on Maori visit, 1920. 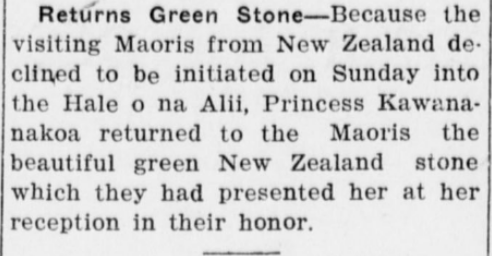 Returns Green Stone—Because the visiting Maoris from New Zealand declined to be initiated on Sunday into the Hale o na Alii, Princess Kawananakoa returned to the Maoris the beautiful green New Zealand stone which they had presented her at her reception in their honor. The Maui News. 21st Year, Number 1059, Page 6. July 2, 1920.